If you haven't shopped on Lulu's before, then you need to go check them out! I have had several compliments on these yellow polka dot jeggings & they are super affordable! They pair perfect with a slouchy light-weight sweater transitioning from winter to spring! Not to mention yellow seems to be my color of choice right now! I have been wearing them daily, they are the perfect go-to style to add to any outfit! Lulu's is offering 15% off for Pillow Thought readers!! I love this outfit!! it is so cute!! you are always one fabulous mommy!! Just so you know i am giving away a 18k gold monogrammed necklace on the blog!! you should check it out!! those pants are beautiful! Love them with that sweater!!! Yay for discounts! 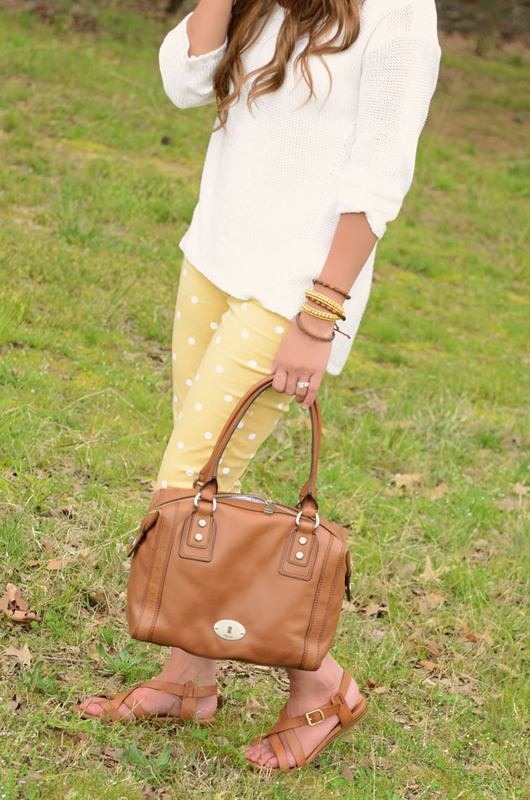 I love these pants ... and Lulus! I was literally speechless when I saw those pants. Dying from the cuteness. Need to purchase right now! oh my geosh i am in LOVE with those pants! so cute! This look is just right! Not too much, not too plain, just right! Love it! You look so cute! I am a Mormon too, and how do you find so many cute and modest outfits, especially dresses? thank you!! It definitely makes things more challenging! I look around a lot and when I find something thats modest I have a hard time turning it down! Try ASOS they have a lot of knee length dresses with sleeves!